An amazing 25 days exploring Zululand, Swaziland, Kruger National Park, and more. Game viewing is the main attraction of this extensive and exciting safari experience! 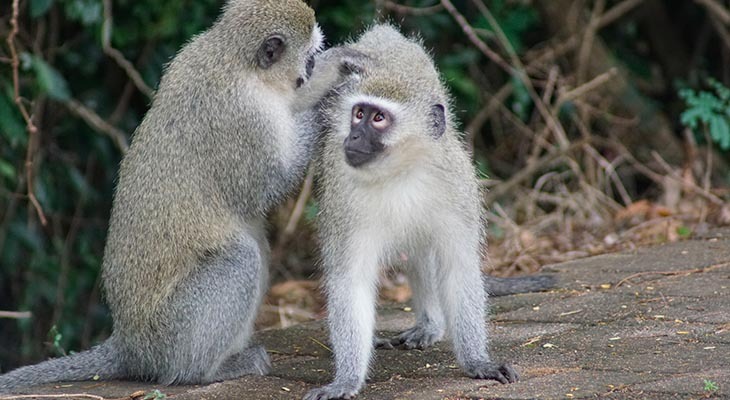 See the great camps and wildlife of some of South Africa’s best known national parks, experience the wild and intimate sand forest of Tembe Elephant park, and soak in the soaring landscapes and geological wonders of Swaziland and the Panorama Route. See below for a day-by-day outline! Arrive Johannesburg (OR Tambo airport) – connecting flight to Richards Bay. Overnight B&B in Richards Bay. Morning departure from Richards Bay for Hluhluwe-iMfolozi Game Reserve. Centrally situated in the Imfolozi section of the Park, Mpila Camp commands magnificent views of the Wilderness area. Game viewing is the main attraction in the iMfolozi Game Reserve. Larger mammals to be seen include buffalo, blue wildebeest, zebra, giraffe, elephant, and large numbers of impala, waterbuck, common and mountain reedbuck, nyala, kudu, bushbuck, steenbuck, duiker, warthog, black rhino, lion, leopard, cheetah, hyaena and jackal. In excess of 300 species of birds have been recorded. Overnight tented safari camp, Mpila Camp. Morning and afternoon game drives from Mpila Camp. Overnight in Mpila. Morning and afternoon game drives from Hilltop camp. There is also the option of going on a guided walk with an experienced armed ranger, or going on a night drive searching for elusive nocturnal species (not included in quote – optional extra for your own account). Overnight Hilltop Camp. Morning departure for Tembe Elephant Park. 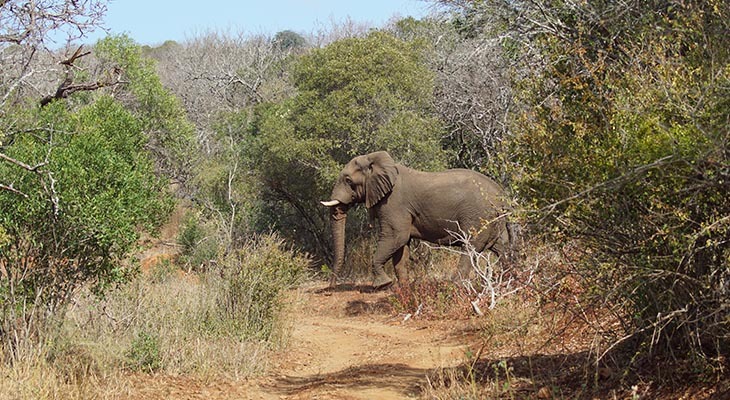 Tembe is situated in the north eastern region of KwaZulu Natal, now known as the Elephant Coast. This reserve was established in 1983 to protect the last remaining herds of “free-ranging” Elephant in South Africa, known as the “Great Tuskers”. These herds migrated seasonally between Mozambique and the north of Zululand; however they faced constant harassment over the border, and preferred to stay in the dense Sand Forest thickets of Tembe. Tembe is one of the few places left in South Africa where the true African wilderness experience can still be enjoyed. Overnight Tembe. Ndumo is characterized by beautiful pans, extensive wetlands, yellow fever trees and reed beds, acacia savannah and sand forest. The diverse and varied habitat plays host to an impressive range of aquatic birdlife like Black Egret, Pelicans and Pygmy Geese. The keen birder can also enjoy rewarding sightings of Pell’s Fishing Owl, the Broadbill and Southern Banded Snake Eagle. 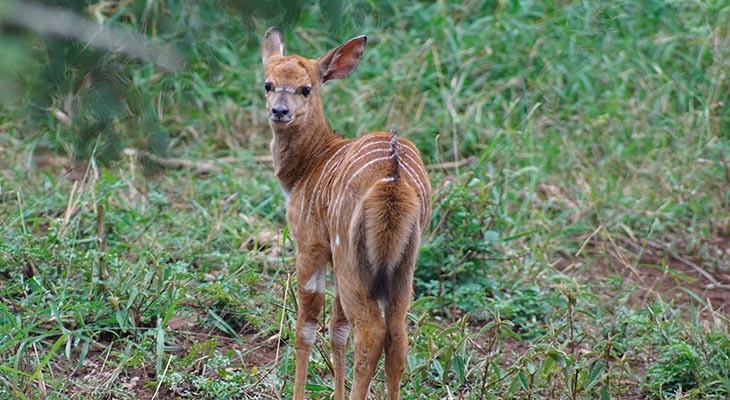 Resident game that can be seen in Ndumo Game Reserve include Nyala, Red Duiker, Impala, Bushbuck, Suni, Black and White Rhino, Hippo and a large concentration of Crocodile. One of the most scenically beautifull and game productive drives in Ndumo is around the large Fever Tree lined Nyamithi pan, which will afford you the opportunity to view and photograph an astounding variety of birds and animal life. Return and overnight Tembe. Morning departure for Kosi Bay. The Kosi Bay Nature Reserve lies on the coast in the northern part of KwaZulu-Natal and surrounds the unique and beautiful Kosi Bay lake system which is part of the Greater St Lucia Wetland Park, a World Heritage Site. This system consists of four lakes and a series of inter connecting channels which eventually drain via a sandy estuary into the Indian Ocean. It is home to a large variety of birds and animals including hippos and crocs. Humpback whales can be seen off the beaches on their northerly migration to calve in Mozambique and in December and January loggerhead and leatherback turtles come onto the beaches to lay their eggs in carefully prepared nests. Proclaimed in 1950 and extended in 1984. This is the most pristine lake system on the South African Coast. The Kosi Bay area is of considerable botanical importance with several Red Data species found here. The swamp forests found in this area are the largest in the country and the giant palm Raphia australis, on which the Palmnut vulture is dependent, is at its natural southern limit here. This is the only area in South Africa where five species of mangrove are found, two of which (Luminitzera racemosa and Ceriops tagal) are at the southernmost limit of their distribution. The rural people in the area use traditional fishing methods to harvest the numerous fish species in the estuary. Fish kraals or traps, which have been passed down from father to son, are spread throughout the estuary, providing an important source of protein to the local people and a tourist attraction to Kosi Bay’s many visitors. Good management and the controlled use of resources makes Kosi Bay an excellent example of the concept ‘wise use in action’. We depart on a boat cruise exploring the Kosi Bay Lake system. Dinner and overnight Tembe. Mlilwane, Swaziland’s pioneer conservation area, is a beautiful, secluded sanctuary situated in Swaziland’s “Valley of Heaven”, the Ezulwini Valley, in between Mbabane and Manzini. With 24-hour access to the Sanctuary, guests are free to enjoy the neighboring tourist hubs of Ezulwini and Malkerns, with their many unique attractions and craft shops. From the western boundary, the huge Usutu Forest provides a dramatic backdrop stretching into the distant hills. Overnight Mlilwane Wildlife Sanctuary. Morning departure for Hazyview and the Mpumalanga Lowveld. Situated on the banks of the picturesque Sabie River, Hazyview is the most convenient jumping off point for many private game reserves and all points in the Kruger National Park, being just 16 km from Numbi Gate and 12 km from the new Phabeni gate. Hazyview is also an excellent stepping off point for many of Mpumalanga's points of interest, the Blyde River Canyon, Pilgrim's Rest, Bourke's Luck Potholes and others. Overnight Rissington Inn, Hazyview. Morning departure for the “Panorama Route”. The Panorama Route is one of the most beautiful and popular travel destinations in South Africa. The Panorama Route leads through the rugged mountain range of the northern Drakensberg in the Mpumalanga province of South Africa. The Panorama Route passes the north-eastern part of the Great Escarpment, the inland plateau declines abruptly and steeply and opens up fantastic views of the plains of the Lowveld a thousand meters below. This view is most reliable in the dry winter months. At other times the spectacle is often impaired, since the escarpment is a barrier for the clouds coming from the east, rising at this point and bringing a lot of rain. The most spectacular stretch of the Panorama Route is the Blyde River Canyon. From many well-positioned vantage points one has a view of the 33 km long gorge, which starts at "Bourkes Luck Potholes" and ends at the "Three Rondavels". The Potholes are very impressive rock formations that were shaped millions of years ago by erosion. The bizarre swirl holes developed when the once rapid river carried masses of sand and debris. Overnight Rissington Inn. After breakfast we depart for the Kruger National Park, from where we will enter the reserve at the Phabeni Gate, and proceed to Lower Sabie Camp. Morning and afternoon game drives from Lower Sabie, exploring the surrounding areas. Morning and afternoon game drives from Satara, exploring the surrounding areas. Morning departure for Mopani Camp. On the banks of the Pioneer Dam in the Kruger National Park, lies it’s best kept secret. Named after the Mopane veld that surrounds the camp, Mopani Rest Camp nestles amongst the Mopani tree covered koppies. A signature feature is the huge gnarled old baobab tree in the heart of the camp. The vegetation inside the camp is left as found in the wild, adding to the unique atmosphere of the camp. 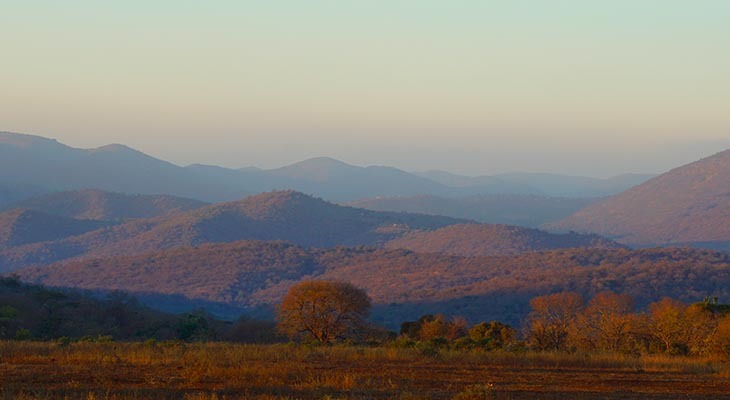 The Mopane veld in this region is a favourite haunt for large herds of Elephant and Buffalo, and although the area is not as scenic as the southern reaches of Kruger, the rugged and dry bush dotted with large Baobab trees exudes an ancient character. Overnight Mopani Camp. Morning and afternoon game drives from Mopani exploring the surrounding areas. Historically rich in context, Punda Maria camp has been known in its time as an ivory smuggler destination, an area for the illegal trade of labour and much governmental agitation eventually resulting in direct intervention at one time. 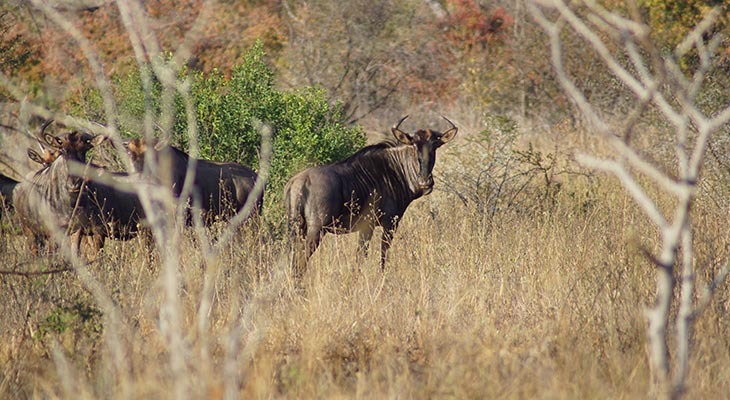 Located in the Sandveld region of the Kruger National Park, the camp itself is considered a prime viewing area for the Nyala antelope, and boasts unparalleled bird watching. 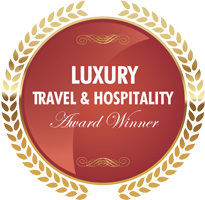 Overnight luxury tented safari camp in Punda Maria. Morning and afternoon game drives from Punda Maria exploring the surrounding areas. Overnight luxury tented safari camp in Punda Maria. Morning departure from Punda Maria for Polokwane. Polokwane, meaning "Place of Safety", is a city in the Polokwane Local Municipality and the capital of the Limpopo province, South Africa. It is also often referred to by its former name, Pietersburg. Here we will spend the final night of your South African safari reminiscing on the sightings and adventure of the past days. Overnight Getaway Gateway, Polokwane. Morning return flight to Johannesburg (OR Tambo airport).